Global Dialogue 2011 has already begun. Global Roundtables have begun, and you can participate now, today. To see the work done click on a Global Roundtable in the Listing of the Global Roundtables. Workshop Sessions have also already begun. Start your own Workshop Session. Follow the process on the front page. Be a Leader. The period August 17-22 is a time for the Workshop Sessions for summarizing results, and August 31 is the closing of Global Dialogue 2011. If we continue to have sponsoring, Proceedings 2011 will be written and published in September/October 2011 and will be made available on the website of the Global Community afterwards. Read the Proceedings of the Global Dialogue since it started in 1985. Any change in the scheduling of Global Dialogue 2011 will be shown on the website. The proposed framework for sessions, and Opening and Closing Ceremonies is now available. Scheduling at the physical site and the proposed framework for sessions at the physical site, i.e. day(s) of the Global Dialogue at the physical site, and number of days reserved at the physical site, may change, and we may not know for certain about these parameters until July 2011. Participants may apply to lead a Global Roundtable(s) and/or a Workshop Session(s). Each Global Dialogue 2011 issue is connected to a Workshop Session or to a Global Roundtable. To connect with each Global Roundtable click on a Global Roundtable in the Listing of Global Roundtables 2011. Participants send their articles, research papers, comments, videos and other works of art, recommendations, and results from a forum or a brain-storming exercises. The work of each participant is entered in his/her individual FILE and summarized in the Global Roundtable section "Work from participants and authors with a summary or abstract of each work". Leaders of the Workshop Sessions being held all over the world and in Nanaimo and Leaders of Global Roundtables are allowed to organize their sessions in their own town, global community, university or home, wherever, as long as they assume all costs and responsibilities. Noone is being paid for their work and expenses. This is strictly on a volunteering basis and no money is available or will be available. You may also invite the public, experts and all Participants to your Global Roundtable or Workshop Session. This is a grassroots process and everyone is invited. Daily results of the Global Roundtables and Workshop Sessions are to be sent by email to globalcommunity@telus.net in the message area of the email (please no attachment unless necessary). Each email message should not be larger than 60 KB. Send several messages but try to be within this limit. Only messages with email addresses shown under the Participants List will be read. All Leaders are required to send an Opening Statement related to their Global Roundtable or Workshop Session. A Closing Statement should also be sent during the period August 17-22, 2011. These statements along with the comments and recommendations will be inserted in the space reserved to each Global Roundtable and Workshop Session on our website. All Leaders will contact (by email) paper submitters who have written Lead Papers within their respective Global Roundtable and Workshop Session and ask for comments and recommendations. All papers must be reviewed. During the period August 17-22 leaders will summarize results and email them as well. This table displays all Global Dialogue 2011 Roundtables. Corresponding Global Dialogue 2011 issues are shown in parenthesis. Send an email specifying the roundtable you wish to be part of. A link with your name and info will be created in the Global Roundtable. Then follow the link and see your work added along with the work of others. 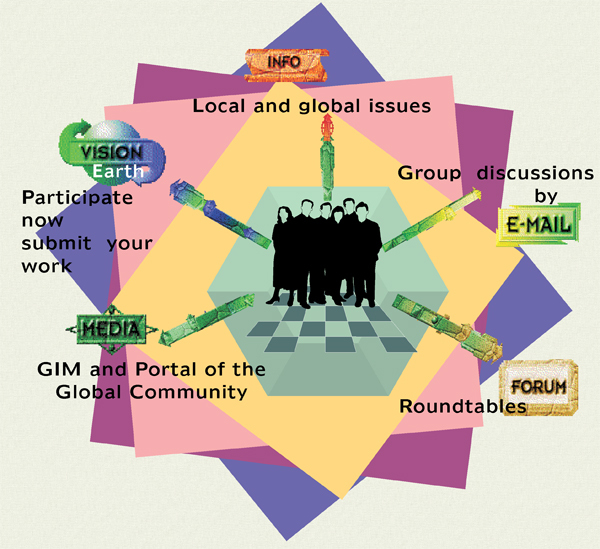 At the end of Global Dialogue 2011, the Global Overview will mention your work and recommendations will be writen. To see the work from Participants click on a Global Roundtable. Concluding remarks drawn from the roundtables will be made available here at the end of Global Dialogue 2011.